The Lake Buccaneer is an American four-seat, light amphibious aircraft originally developed as the Colonial C-2 Skimmer, itself a development of the two-seat Colonial C-1 Skimmer. 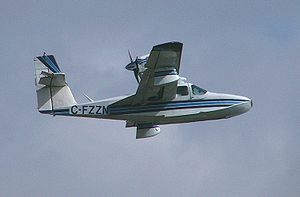 The C-2 Skimmer was developed in the late 1940s as a four-seat variant of the earlier C-1 Skimmer. It is a cantilever, shoulder-wing monoplane amphibian with a single-step all-metal hull with retractable tricycle landing gear. It is powered by an Avco Lycoming piston engine in pusher configuration, pylon-mounted above the hull. The manufacturing rights were acquired by the Lake Aircraft Corporation in October 1959 and the aircraft was built as the LA-4, Lake Amphibian with a 180 hp (134 kW) Lycoming engine. This further developed into the Lake Buccaneer which was essentially the same airframe with a 200 hp (149 kW) fuel injected engine. A variant called the EP (extended prop) added an additional cargo door and engine rear cowling. A six-seat development with a lengthened hull was named Renegade, this had either a 250 hp (186 kW) or a turbocharged 270 hp (201 kW) engine. A military version was called the Seawolf. Data from The Illustrated Encyclopedia of Aircraft (Part Work 1982-1985). Orbis Publishing. pp. 2279–80. The Illustrated Encyclopedia of Aircraft (Part Work 1982-1985). Orbis Publishing. pp. 2279–80. ^ "Lake Amphibians". Retrieved 2 September 2013. Wikimedia Commons has media related to Lake LA-4-200 Buccaneer.